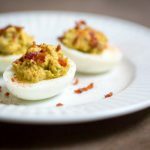 Low Carb Avocado Deviled Eggs is a brilliant and easy way to spice up the party platter with a unique twist on an old favorite. There is no need to use mayo so it's perfect for low carb and keto dieters. Peel eggs and discard shells. Cut eggs in half and put the yolk into a food processor and the white halves onto a plate. Add avocado, sour cream, juice of half a lime, salt and pepper to the food processor. Process for 20 seconds and then scrape down the sides of the bowl. Process for another 20 seconds making sure everything is smooth. Place a large tip into a disposable piping bag and fill the bag with the filling. Pipe into the egg white shells. Sprinkle with paprika if desired.